Written and directed by Welsh man Gareth Evans, The Raid sees an elite Indonesian SWAT team of 20 officers tasked with raiding a run down slum in Jakarta to apprehend the most notorious drug lord known. The only catch is that every floor of this dilapidated tower is filled with psychopathic, murderous tenants, willing to do anything to protect their landlord. What follows is 30 floors of intense, adrenalin charged awesomeness. True colours are shown, loyalties tested and bodies haemorrhaged faster than is possible to keep up with. In a word? HellYeah! The Raid has been lauded as 'the best action film in years' and received a standing ovation following almost every screening its had, that's not for nothing. 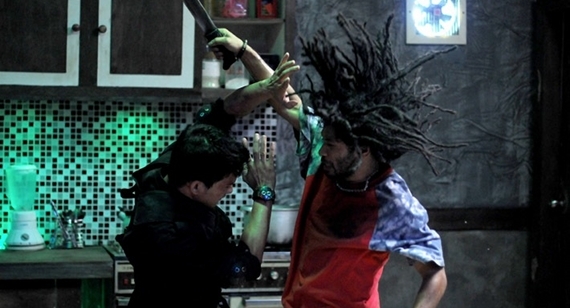 Highlighting the martial arts style of Pencak Silat and using one of its biggest stars (Uwais) as the lead actor and co choreographer this movie grabs you by the throat and doesn't let go. The premise is basic and the storyline simple, although relatively unknown the lead actors are instantly likeable and so very good at what they do. The fight scenes are ridiculously fast, slick and visceral. The camera work recording the relentless adrenalin is second to none and never misses a beat. Through floors, doors, windows, walls and ceilings, we're with them for every kick, slice and bloody, brutal death. The soundtrack is a perfect fit, even in the quieter moments (there are very few) the beat is constant and menacing. There's dark humour peppered throughout that serves to round out the characters and make this movie that much more likeable. Presented in Indonesian with English subtitles, Sony have already bought the rights to produce a Hollywood remake of The Raid. I would urge you, as strongly as I can, to see this, the original first. I have never experienced audience reaction like it before, from gasps of shock and surprise, moving to the edge of seats, muscles clenched en masse to eruptions of spontaneous, appreciative applause, this is definitely one to be viewed on the big screen and with a group. I can see you shaking your head, telling yourself this isn't really your bag - I thought that too, until I watched it. I'm not really a martial arts fan but I can appreciate true masters at work and beautiful cinematography while they do it. Easily my favourite film of the year so far and probably my favourite action movie of, y'know, ever. Go. Go now. Can safely say that this movie is going to be hard pressed to be beaten with regards to the action sequences. The first 5 minutes are spent on the way into the building, the rest of the movie is action, sweat, bullets, blood, explosions and super fast and awesome fights. When I went to see this movie there was a lot of ladies in the audience, and like us guys they found the movie to be exhilarating. The trailer is great for gauging how the movie is going to be, but take it from me the fight scenes have to be seen to be believed. There are some parts of the movie where the audience clinched up, or went ooooo as if they felt the punch or whatever was happening on the screen. This is always a good sign. My brother in law and my wife all raved about the movie too. I told my uncle about it and he could not get over the action in it. If the expendables let you down, and you are sick of “The Stath” beating up everyone check out this movie before Hollywood re-makes this movie and they probably won’t do it any justice unless they get the original actor and director.